If towing is necessary, we recommend having your vehicle towed by your toyota dealer or commercial towing service, using a lift-type truck or flatbed truck. Use a safety chain system for all towing, and abide by all state/ provincial and local laws. 2Wd models: if towing your vehicle with a wheel-lift type truck from the front, the vehicle's rear wheels and axles must be in good conditions. If they are damaged, use a towing dolly or flatbed truck. Awd models: if towing your vehicle with a wheel-lift type truck, use a towing dolly. The following may indicate a problem with your transmission. Contact your toyota dealer or commercial towing service before towing. The engine is running but the vehicle will not move. Do not tow with a sling-type truck to prevent body damage. If your toyota is transported by a flatbed truck, it should be tied down at the locations shown in the illustration. If you use chains or cables to tie down your vehicle, the angles shaded in black must be 45�a. 2Wd models: be sure to transport the vehicle with the front wheels raised or with all four wheels raised off the ground. If the vehicle is towed with the front wheels contacting the ground, the drivetrain and related parts may be damaged. Awd models: be sure to transport the vehicle with all four wheels raised off the ground. If the vehicle is towed with the tires contacting the ground, the drivetrain or related parts may be damaged, the vehicle may fly off the truck. 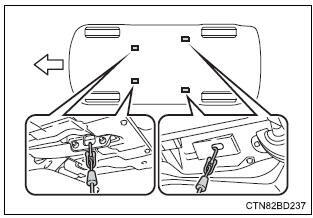 Never dinghy tow your vehicle to prevent causing serious damage to the dynamic torque control awd system (awd models) and transmission.